Please tell us a bit about Intuition Robotics and your new AI product introduction. Intuition Robotics is a startup company that’s developing social companion technology to help keep older adults active and engaged by connecting them seamlessly with family and friends, making technology accessible and intuitive, and proactively promoting an active lifestyle. Our first product, Elli•Q inspires participation in activities by proactively suggesting and instantly connecting older adults to digital content such as TED talks, music or audiobooks; recommending activities in the physical world like taking a walk after watching television for a prolonged period of time, keeping appointments and taking medications on time; and connecting with family through technology like chatbots linked to Facebook Messenger. Using “Natural Communication” such as body language that conveys emotion, speech interface, sounds, lights and images to express herself, Elli•Q is emotive, autonomous, and easily understood. Using machine learning, she learns the preferences, behavior, and personality of her owner, and proactively recommends activities based on that history and recommendations by family. What is the state of artificially intelligent companions on the market today? The personal robotics market is becoming very interesting with an influx of new products and innovators such as Amazon Echo and Jibo that are more automated lifestyle gadgets that are optimized to the fast-paced lifestyle of the digital generation, reacting to commands given by the user. On the other hand, robots like Paro are designed as therapeutic companions for older adults with cognitive disabilities. These options provide an opportunity to address the able and independent older generation. That’s where we come in with Elli•Q. The cognitive computing tech we developed enables ElliQ to not only react to commands but also proactively suggest activities for the older adults, such as going for a walk based on the weather, reading the news, finding new music, or video-chatting with a friend. This is personalized and initiated at a time selected by the system based on contextual understanding and autonomous decision making. Where can social companions have the highest impact? Social companions have an impact on anyone they interact with but we believe that older adults, who may live alone and far from family, can have an immediate positive benefit. Many of these older adults are able-bodied and lead independent lives, but feel lonely and possibly socially-isolated. They also often have a hard time using the technology that younger generations use to communicate. A social companion specially designed for this population can improve the way they communicate with family and friends and assist them in keeping an engaged and active lifestyle. The companion won’t solve loneliness, but it can help bring people closer together. How can AI bots combat social isolation and loneliness among older adults? Neither Elli•Q nor any other social robot will solve loneliness, but Elli•Q can help bring people closer together, making it simple to connect with your family and friends, assisting you in consuming interesting digital content, and proactively offering activities and content you couldn't easily access prior. How do you introduce this kind of technology to a generation that is typically wary of new tech? Although the technology is new, Elli•Q is designed to be discrete without looking like a traditional robot. In fact, it doesn’t look like any other robot out there. Yves Behar’s unique design allows for intuitive interaction with people. 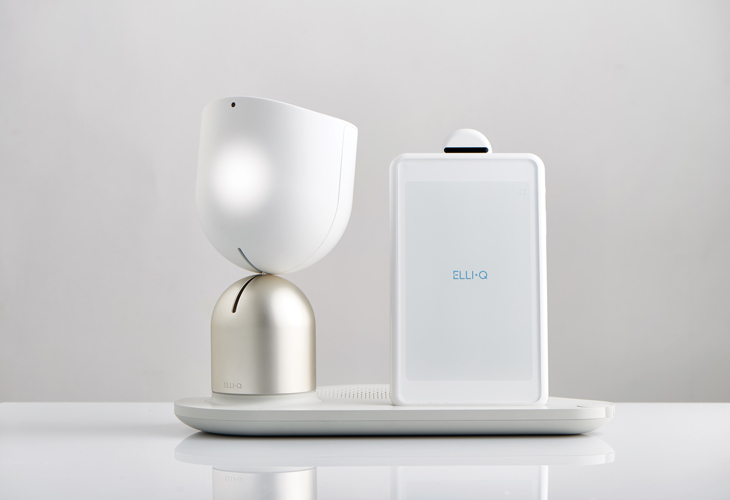 With “natural communication” technology, we’re committed to making Elli•Q’s communication as natural and highly emotive as possible to bring a warm personification to the robot, which will help integrate it into lives of those who are wary of new devices and technology. With Elli•Q, we're actually simplifying the tech experience for older adults. We're also conducting tests in homes of those who are in our target market to better understand how the robot will function over time and how we can improve the device and to optimize it for the desires of future users. How is Intuition Robotic's ElliQ different from other AI robots on the market today? Elli•Q is different from robots that are focused on reacting to commands or robots providing therapeutic benefits to cognitive disorders because it’s designed with deep insights to address the specific challenges of older adults who are of able body and mind and living independently while respecting their stage of life. ElliQ doesn’t focus on limitations or disabilities, and proactively suggests activities without becoming a system of dependence for the user. Using cognitive computing, it also develops an understanding of the user’s environment and goals, adapting future suggestions and interactions to the user’s behavior patterns and personality traits. How do you think the future of this kind of product will evolve over the next few years? I have no doubt that we’re just at the very beginning. We believe we’re moving towards an era where technology adapts to us and learns how to better communicate with us naturally versus the current state in which we learn how to communicate with technology. With advancements in cognitive computing, we’ll see more and more autonomous systems that make independent decision against goals humans set and then act. As for the older adult market, I believe there is lots of room for entrepreneurs to create wonderful products that celebrate aging and help fulfill the needs of an underserved population. Can you talk about any other developments or products you are working on? We are currently focused on Elli•Q and the trials we will be starting in February in the Bay Area, after which we’ll communicate what’s next.